If you ever find yourself in a pub with me, chances are that at some point, the conversation will turn to death. Not just death, but the terrifying and horrible ways people have succumbed to it in the past. I have often heard a story retold about a man who attended the execution of his friend during the French Revolution. 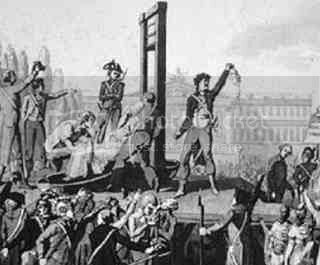 Seconds after the guillotine fell, the man retrieved the severed head and asked it a series of questions in order to determine whether or not it was possible to retain consciousness after decapitation. Through a system of blinking, the victim allegedly communicated his message back to his friend. The ending to this story changes according to the whims of the narrator… or perhaps the number of drinks he or she has consumed by that time. I wondered: was this the 18th-century equivalent to an urban legend? Or could there, in fact, be a degree of truth in this ghastly tale? My investigation into this grisly subject took me down some strange but intriguing paths. Good article, but kind of horrifying to think about all those people being conscious for a short time afterwards. I always assumed that death by guillotine was instant. On second thoughts... no it doesn't! I follow that site on FB and they have some interesting stuff for sure.